Helium, latex balloon, electronics, FM transmission. Exhibited in the group show Dyanmics of Air. Curated by Malte Wagenfeld and Jane Burry. Sounding the air is a new iteration from a series of ‘balanced balloon’ projects that I have undertaken since 2013. In this project, the uplift of a large helium balloon is balanced by an FM receiver and loudspeaker, creating a buoyancy-neutral assemblage that is sensitised to the subtle changes in air movement and temperature. The work circulates, rises and falls through the gallery space in response to these qualities of air. 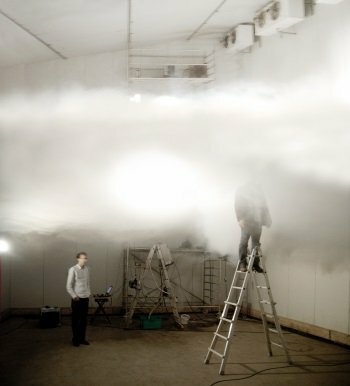 ‘Sounding’ is understood as process of building up a three-dimensional understanding of the atmosphere – much like the mapping of marine environments – as well as an aural testing of propositions about air. The aural component of the project is a low-power FM transmission that is broadcast throughout the gallery space. It consists of an aural essay on air, constructed from a wide variety of quotes from poetry, fiction, and non-fiction texts interspersed with field recordings of air-activated environments. This transmission is received by the balloon assemblage, subject to distortions and interferences from the physical environment and other electronic transmissions present throughout the gallery. Thanks to Ariel Aguilera, Andrea Benyi, Sarah Burrell, Joni Chan, Scott Andrew Elliott, Dan Griffin, Hilary Johnson, Djurdjica Kesic, Sommer Spiers, Rachel Swain and Virpi Vellin for lending their voices to the project. Installation images by Mark Ashkanasy ©RMIT Gallery. Used with thanks. • David Abram. “The Commonwealth of Breath.” In All Our Relations : 18th Biennale of Sydney / Editors: Catherine De Zegher and Gerald Mcmaster, edited by M. Catherine de Zegher, 334-41. [NSW] :: Biennale of Sydney, 2012. • Shusaku Arakawa and Madeline Gins. Architectural Body. Modern and Contemporary Poetics. Tuscaloosa: University of Alabama Press, 2002. • Monika Bakke. Going Aerial : Air, Art, Architecture. Maastricht: Jan van Eyck Academie, 2006. • Juliana Engberg. Pipilotti Rist : I Packed the Postcard in My Suitcase. Southbank, Vic. : Australian Centre for Contemporary Art, 2011. • Tim Ingold. “Footprints through the Weather‐World: Walking, Breathing, Knowing.” Journal of the Royal Anthropological Institute 16 (2010): S121-S39. • Tim Ingold. ”Lines and the weather.” In Vital Beauty : Reclaiming Aesthetics in the Tangle of Technology and Nature, edited by Joke Brouwer, Arjen Mulder and Lars Spuybroek, 12-28. Rotterdam: V2 Publishing : Nai, 2012. • Luce Irigaray. The Forgetting of Air in Martin Heidegger Luce Irigaray ; Translated by Mary Beth Mader. Constructs Series. 1st ed. ed. Austin: University of Texas Press, 1999. • Mark Jackson and Maria Fannin. “Letting Geography Fall Where It May? Aerographies Address the Elemental.” Environment and Planning D: Society and Space 29, no. 3 (2011): 435-44. • Allan Kaprow and Jeff Kelley. Essays on the Blurring of Art and Life. Expanded ed. Berkeley, Calif.: University of California Press, 2003. • Alexander McCall Smith. The Uncommon Appeal of Clouds : An Isabel Dalhousie Novel. New York: Pantheon Books, 2012. • Derek McCormack. “Engineering Affective Atmospheres on the Moving Geographies of the 1897 Andrée Expedition.” Cultural Geographies 15, no. 4 (October 1, 2008 2008): 413-30. • Tim Winton. Breath. 1st American ed. New York: Farrar Straus and Giroux, 2008. I have a new project in “Dynamics of Air”, an upcoming exhibition at RMIT Gallery, curated by Malte Wagenfeld and Jane Burry. The exhibition opens on Thursday 13 September from 6-8pm, and runs until 17 November 2018. The show features works by Transsolar, Natasha Johns–Messenger, Leslie Eastman, Cameron Robbins, Philippe Rahm Architects, Breathe Earth Collective, Edith Kollath and many others. Image credit: Transsolar, Testing Cloudscapes. AJ8 has been shown in DesignLife Hangzhou — a bi-annual exhibition that profiles the work of RMIT Design alumni. More details available from the DesignLife website here. INDEX 2016 was held at Site Works in Brunswick. We used materials found on site and donated LVL timber sections to form the majority of the exhibition infrastructure, across two levels of two different buildings. These spaces were brought together under 1000m2 of crop netting that covered the adjoining courtyard. As in years past, students designed and built the entire exhibition in collaboration with myself and a team of industry professionals including Rob Sowter, Pandarosa, Linda Hum, Jess Wood and Aron Hemmingway. All photos by Georgina Matherson. An inflatable replica of the room in which it was housed, AJ8 takes the surrounding RMIT Multipurpose Room, reduces it by half in the X and Y axes then rotates it by 90° and flips it upside-down. This reorientation and doubling of spaces created optical effects in the misalignment of rigid structure and soft inflatable skin, and functioned as a presentation space for my PhD examination. It also housed an additional work: Trying to Stay Focused on Metastability, a small video projector that was suspended by two large yellow helium balloons, whose yellowness recalled the yellow lectern in the ‘proper’ space. Photos by Ramesh Ayyar and Georgina Matherson. For INDEX 2015, we worked with a site loaned to us by Assemble Projects, inspired by materials found on site. We also were supplied with concrete breeze blocks from Austral Masonry, and used light and translucency as additional material strategies. Students designed and built the entire exhibition in collaboration with myself and a team of industry professionals including Rob Sowter, Pandarosa, Linda Hum, Freya Robinson and Aron Hemmingway. INDEX, the RMIT Interior Design graduate exhibition, celebrated the work of the program’s graduating students with an opening event and exhibition in the Weylandts furniture warehouse in Abbotsford. The event is the culmination of a year of hard work planning, fundraising, designing and making by the graduating class and their tutors. I coordinated the year’s activites and was lucky enough to work with Pandarosa who took care of the identity, publication and environmental graphics, as well as with Rob Sowter, Nick Visser, Linda Hum and Rohan Bevan who greatly assisted the student group with the exhibition build. INDEX, the RMIT Interior Design graduate exhibition opened last night, after a year of hard work planning, fundraising, designing and making by the graduating class and their tutors. Many thanks to Pandarosa for another amazing job on the identity, publication and environmental graphics, and to Rob Sowter and Rohan Bevan for their help onsite with the exhibition build.